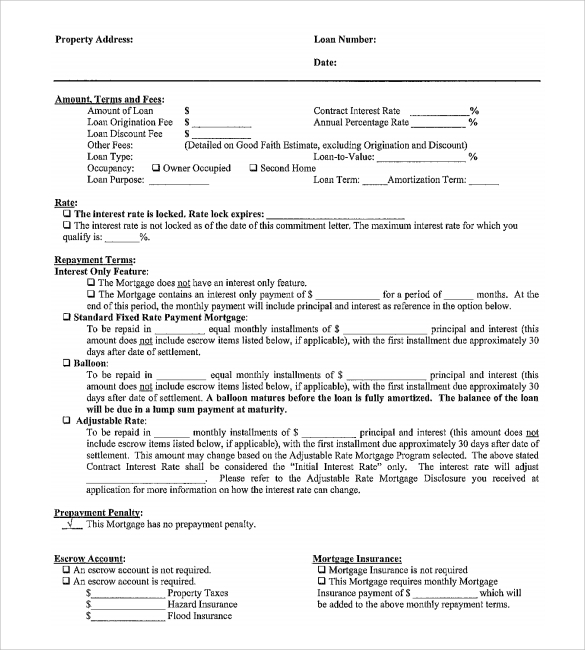 A sample template for mortgage commitment of this kind is a very formal type of letter including almost all the basic terms and conditions required to be recorded and maintained in the process of a home loan sanctioning. The terms and conditions in this letter is very clearly stated and well defined under subheads which will help to remove any kind of confusion regarding the deal. 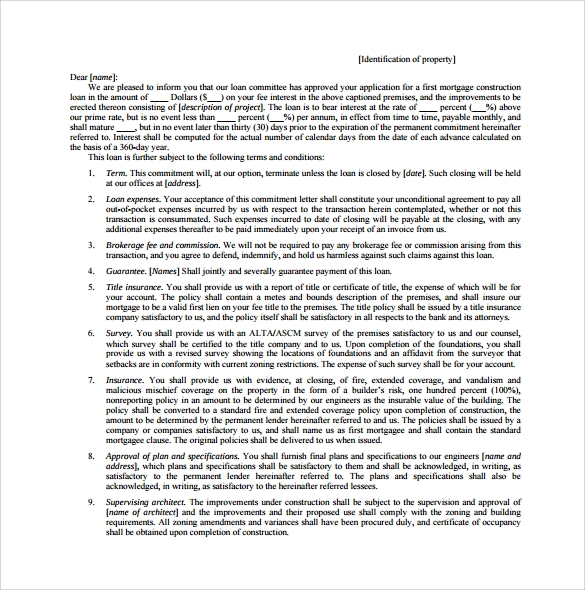 A very short and crisp mortgage commitment letter template, this one is suitable when you have applied for a smaller amount of loan. This one page document though short, it does not fail to mention any important point pertaining to the finalizing of the loan. Just getting the template printed and entering your particulars is all that is required to get the letter ready for submission. 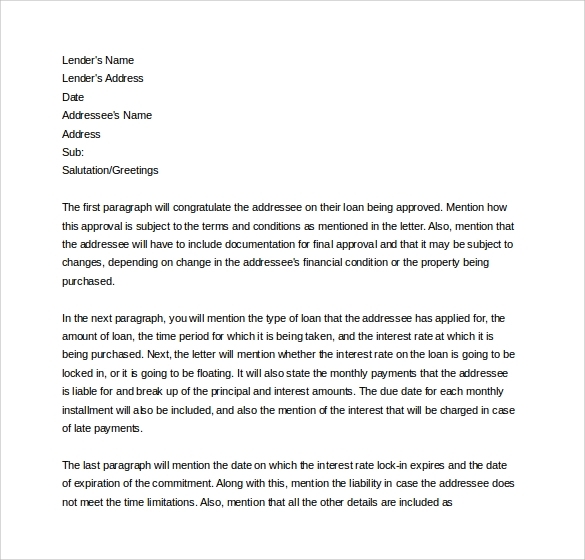 This mortgage commitment letter format is a general one with no unnecessary designing and use of flowery words. This format starts with the good news about the loan sanctioning. The letter ends in 3 paragraphs only in which the second paragraph writes about the property being mortgaged and other financial details and the expiry details regarding the commitment and the lock period is duly mentioned in the last paragraph. 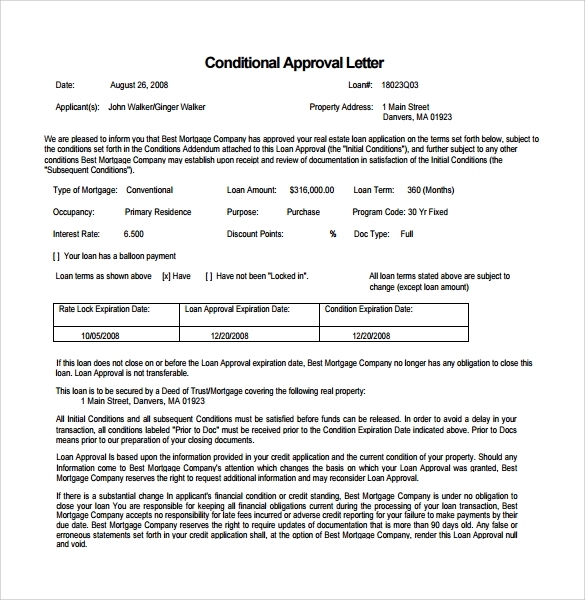 This example template, also known as condition approval letter, has different crucial points mentioned neatly in an easy to note and understand pattern. In this particular format the rate of interest, the lock period, loan expiration and condition expiration date is mentioned in a table form which is easy to catch your attention. Now when your loan is sanctioned and you receive a letter from the bank on the sanctioning of the same you would be intimated through a commitment letter. A commitment letter written in this format will be free from any kind of ambiguity and doubts. 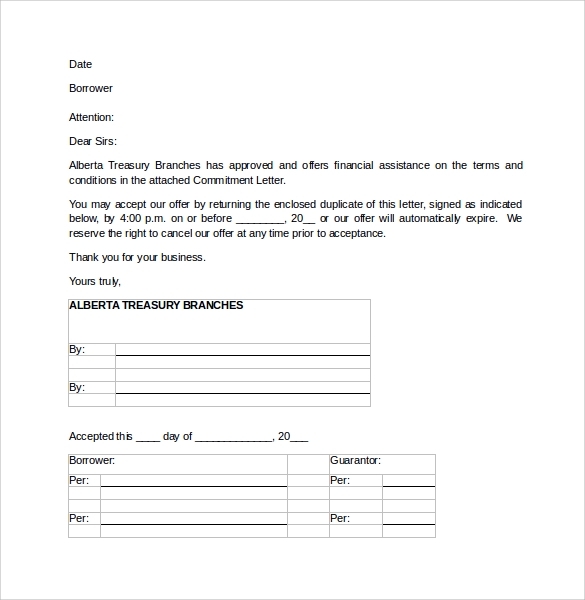 Ready to use format this one allows you to just print and use after entering the few important financial details in the first few lines of the letter. 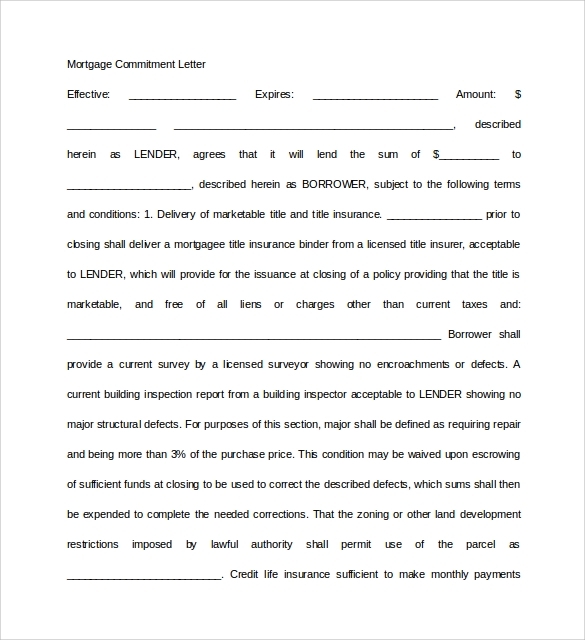 When you are looking for a mortgage commitment letter template help it means you are almost done with process of finalizing your dream purchase. It is only after that your loan application is accepted you are required to get the mortgage commitment letter ready. A template selected as per your needs from the examples duly listed above is obvious to make the process towards the sanction of the loan easy and time saving.